People with hand injuries are sometimes fitted with an exoskeleton, a robotic hand that helps patients grasp and release objects and assists with their rehabilitation. In most cases those gloves are made of hard materials that don’t easily conform to the human hand. Now scientists working in Singapore have devised a new robotic glove that uses soft materials and pneumatic actuators that can make adjustments based on the dimensions of the fingers. 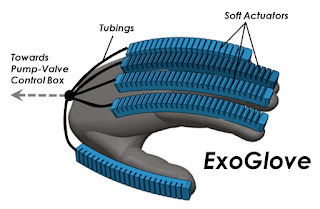 The invention is called the ExoGlove and it was developed in the Evolution Innovation Laboratory at the National University of Singapore by Dr. Raye Yeow and Mr. Yap Hongkai. The target customers for the ExoGlove are patients who have hand impairments due to neurodegenerative diseases such as ALS and Parkinson’s disease, muscular dystrophy, and stroke or traumatic brain injuries. Those impairments require physical or occupational hand rehabilitation. The video below shows the ExoGlove in action.